We all know that losing weight is a process that works on negative energy balance which means that you have to burn more calories than you consume, and fast running helps you achieve just that. Slow running at a comfortable pace also helps but just in improving your metabolism and not in losing weight. If you are looking at weight loss by running, you have to chalk a plan that is meticulous yet realistic and consistent. Intense workouts stimulate your body to burn more fat. As a matter of fact, your body needs energy in huge quantity after the workout to carry out the recovery process and that is when you burn calories even after the workout is over. In this article, we bring you the three most effective ways of incorporating running as a workout in your schedule. In this training, the intense workout should span a maximum time frame of 30 seconds. In this, the running session includes submaximal sprint  as well as the recovery phase, which is a slow walk. Research done by Poliquin Group says that sprinting is a sure shot way to achieve weight loss by running, build muscles and improve your metabolism. In this, the work phase is approximately 4 minutes. If aiming at weight loss by running, you should run for 5 minutes at your best capacity. Follow this up with a recovery phase consisting of 4 minutes of a slow jog. Repeat the cycle 4 times. Weight loss by running program, you have to run at a constant pace as opposed to the previous two where intervals were involved. Adjust the intensity of your run according to your heart rate. While running, following an 80/20 rule is the key to achieve consistent results. Now, have I left you wondering what an 80/20 rule is. which is they all did approximately 80 per cent of their training at low intensity and the rest 20 per cent involved the high-intensity workout which included running . This weight loss by running program lasts 30 minutes. Warm up well before the run by running at a moderate pace for say 10 minutes. Gradually start your run at the best pace and keep at it for at least 20 minutes. Now jog at a slow pace to give your body a cool off period. Running is considered one of the high-intensity workouts which keep the body in an accelerated state even when you are not running. This means your body is working to burn calories even when the exercise is finished. This leads to increased metabolic rate and keeps the body machinery at work even when you are doing activities other running or exercising. When you are targeting weight loss by running, you end up burning calories in the exercise. If you adopt a walk and run (as explained in our “Include Intervals in Your Run” section), your body is boosted in its ability to burn calories by being more reactive and dynamic in nature (since the heart falls and drops). Another benefit of running is that it acts as an antidepressant and gives a feeling of liberation. 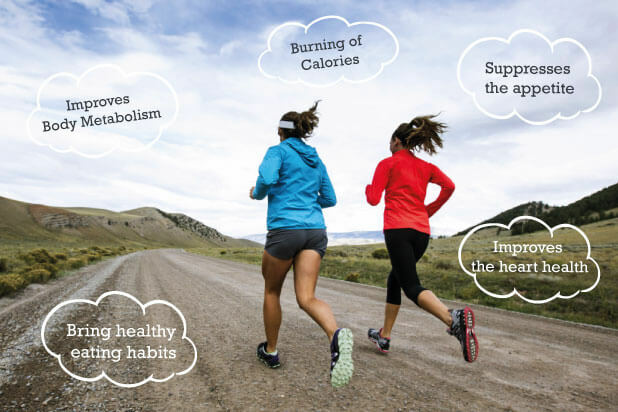 Running paves way for a healthier heart . It keeps the cardiovascular system up and about. When you run, your heart rate increases which essentially puts the arteries and heart vessels to work, which keeps them healthy. Going for a run regularly also helps in keeping ailments like high cholesterol and diabetes at bay. What is it that you crave for after a long run? Yes… A tall glass of water… or any other fluid which is refreshing. It has been found that the brain automatically is inclined towards low calories foods rich in water content after a run because of the thirst experienced by the body. This actually helps in maintaining the negative energy balance and helps undergo weight loss by running . Your body needs healthy nutrients for recovery of your muscles after a hectic run. The body feels much better if fuelled with healthy low-calorie food rather than foods rich in fat and empty calories. Thus, after a certain time, the body starts reacting positively to healthy food patterns thus forcing the mind to incline towards healthy eating habits. How Much Should You Run to Undergo Weight Loss by Running? In order to lose weight, running 3-4 times per week for 45 minutes to 1 hour is good enough. Running should be supplemented with a healthy balanced diet to remain fit and fit for running and pushing yourself further. Weight loss by running also depends on the intensity with which you take those strides. So start running and improve your general health and lose weight! 1. Have a cup of green tea after your run. It has been observed that people who have 3-4 cups of green tea during the day with approximately 35-40 minutes of running tend to lose more weight than people who don’t. 2. Consume more of slow carbs that take time to get digested. Slow carb foods, because they take time to digest keep you feeling full and energized for a longer period of time. 3. Eat carbs a night before your run. The reason for this is that carbs consumed during the night get digested during the next day, which means the body burns more calories burning the carbs the next day. This process is known as diet-induced thermogenesis. 4. Munching on some dark chocolate after your run is a good idea. U.C. San Diego researchers have found that runners who consume dark chocolates are found to undergo more weight by running than who don’t. Dark chocolates have some other major health benefits also . a powerpack of proteins which contains the complete chain of amino acids that are necessary for the building of muscles and fat loss, which ultimately means weight loss. It also is a rich source of betaine, a chemical that prevents belly fat from raising its ugly hood in your body. So what are you waiting for? Slip on your running shoes, plug in some good music and go on your favourite terrain. Most runners have to say that they experience a liberating feeling when they run. So go out and see it for yourself. It is one exercise that does not need any paraphernalia… no equipment, no memberships… just you, your shoes, your music, nature and yes… a whole lot of motivation. We wish you all the luck in your journey of weight loss by running. Though it may take a while for the results to show, do not get disappointed and keep the faith… results shall ensue. So here was a comprehensive article on weight loss by running, its benefits and a few tips for people who wish to maximize the effects of running. Want to know more about health, exercises and nutrition? Talk to a Truweight Nutritionist today. The first consultation is on us! Click here to avail it.